Shi chi go san ceremony and Chitose Ame. Japanese annual traditional event ``Shi chi go san`` is on 15th November so my son got ``Chitose ame`` from his nercery school. The Shi chi go san is parents take their five years old sons (also daughers lately) and three and seven years old daughters to pray for their kids good future, health and growth. Many of Japanese parents do not care about their kids gender recently I think so my son celebrated it when he was three years old, we took some pictures to wear ceremony style outfit at a picture shop and prayed my son's good future, health and growth at shirine near my house. Ofcause I have my Shi chi go san picture. Normary girls wear Kimono and boys wear Kimono or ceremony clothes. Famous shrine in Aichi is ``Athuta Jingu`` you can see Shi chi go san parents and kids at there in early November and Japanese style wedding ceremony thought an year. The Shi chi go san candy is``Chitose Ame`` Chitose means thousand year, ame means candy so it is `` thousand year candy``. 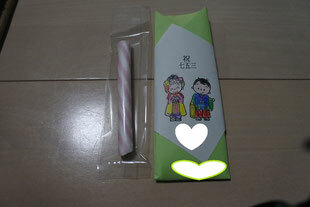 The candy is long, thin, red and white is symbolizes healthy growth and longevity.